Russell and Kitty here. 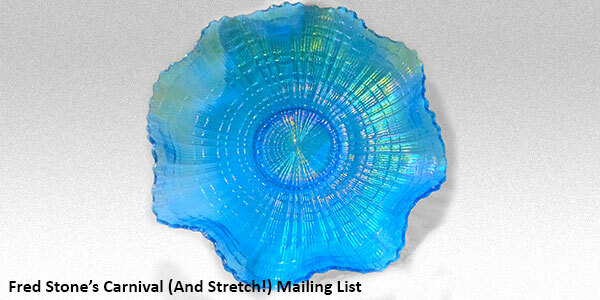 To celebrate carnival glass blues week, we’ll show you some of the Stretch Glass Blues. Consolidated Lamp and Glass Company, Coraopolis, PA made a cased ( two layered glass) vase in their 1927 line of Catalonian. 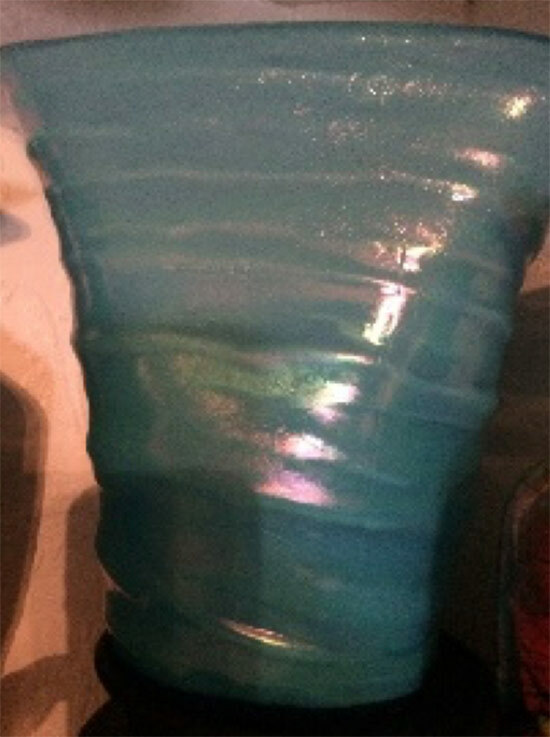 In stretch glass they made a celeste colored vase and a pink vase both of which have the white liner of glass on the inside. 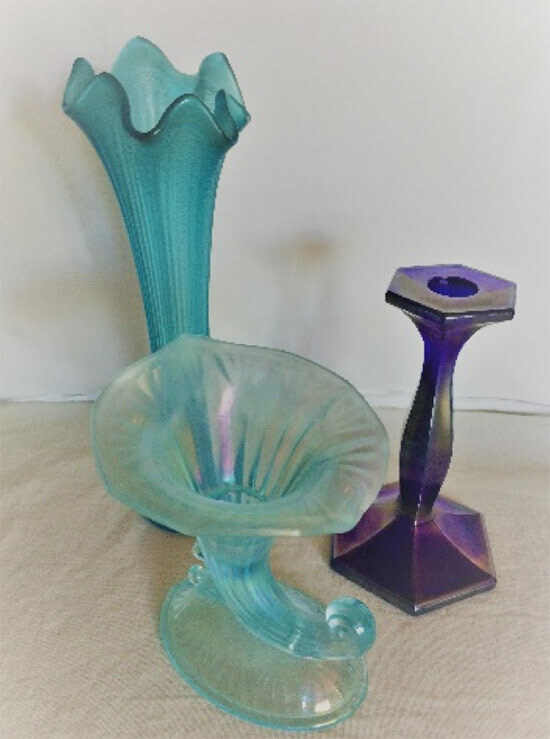 Some stretch glass collectors consider the vases art glass, but it is a pressed glass with an iridescent finish so we consider the vase stretch glass. They are very difficult to find. The Catalonian line mainly consists of noniridescent glass. 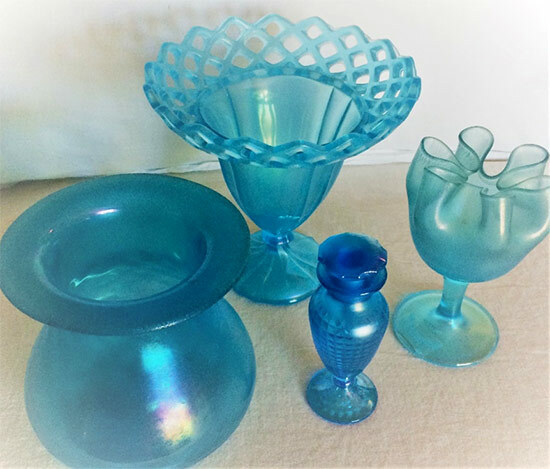 Diamond Glassware Company mainly made Harding Blue, Cerulean Blue (1916), and Vesuvius Blue (1924) are all very close to Fenton’s celeste blue; Blue Crackle (cobalt blue with a heavy dope crackle finish) and Royal Lustre (some of the Royal Lustre has a silvery iridescent finish, but not all of the pieces). Not all author’s agree on the color names, but remember the glass companies were all in business to make money! If the Harding Blue name doesn’t sell the glass they would change the name to something more exotic like Vesuvius Blue! 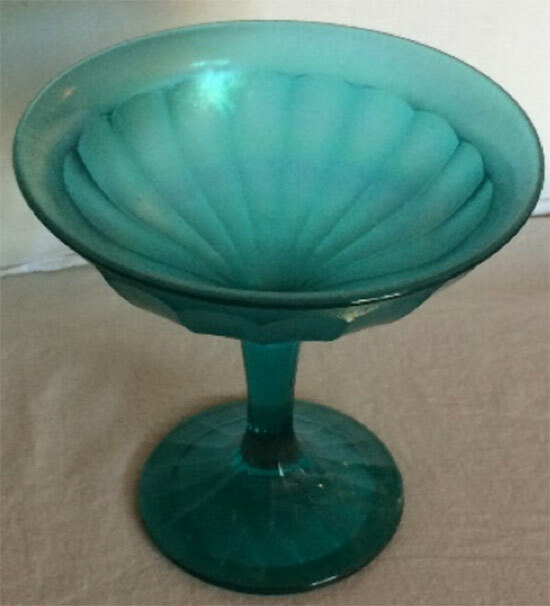 Imperial Glass Company made a teal color of glass which they called “Green Ice” which is a blue/ green color which many collectors call ‘teal blue’. They also made several blue (dope) iridescenes on clear glass which looks blue until held to the light to reveal the base color of the piece. 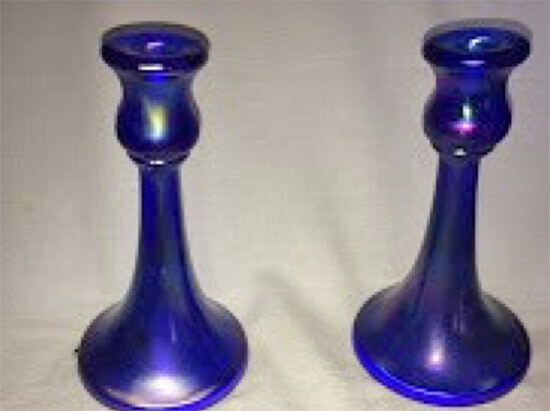 H. Northwood & Company made a blue stretch glass that was listed as “blue Iridescent” generally is darker than celeste blue which many call ‘sapphire blue’, but some of the blues are lighter and a shade closer to celeste, so the blues from Northwood do vary in color from piece to piece. Then they made a Jade Blue which is an opaque blue. 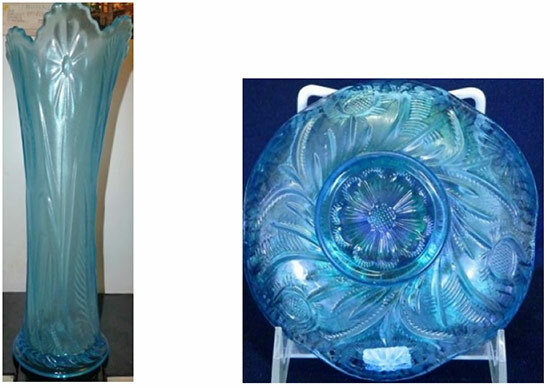 United States Glass Company made a variety of blues because they were a conglomerate of different glass companies. Each glass house used their own formulas to make their color of blue. 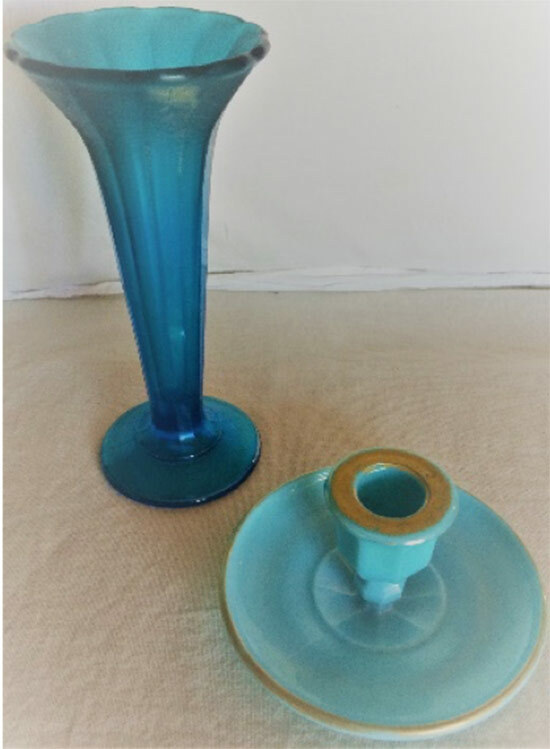 Two blue Field Thistle pieces – vase and a sauce; both pieces are the same color but the backgrounds change the look of the colors. Other companies such as Vineland and Jeanette did make blue stretch glass. In the interest in time and space, we have not included them today. 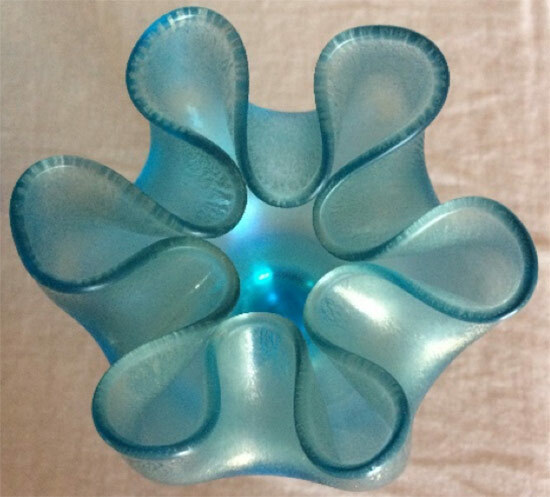 In past weeks, Brian has asked about pieces that look like flowers; this Diamond compote top is our contribution for stretch glass. Only a very skilled finisher could craft this compote top.